Many people consider their eyes to be their most important physical feature. Unfortunately, as we age, the skin around the eyes loses its elasticity and forms wrinkles. Your upper or lower eyelids can also begin to droop, resulting in a tired look and even obstructing your vision. Eyelid surgery performed by Bethesda, MD, surgeon Dr. Roger J. Oldham can tighten loose skin around the eyes for a refreshed and more alert appearance. Many men and women choose to undergo eyelid surgery, or blepharoplasty, to reduce wrinkles and puffiness, diminish the signs of aging, and raise drooping eyelids. Blepharoplasty patients are typically in their mid-30s or older, but younger patients with substantial sagging around the eyes may also be good candidates for the procedure. Your candidacy can be affected by certain ocular conditions, including a detached retina, glaucoma, or dry eyes, as well as other health concerns, such as cardiovascular disease, diabetes, or thyroid conditions. The best way to determine if you are a good candidate for treatment is to undergo an evaluation with a reputable surgeon such as Dr. Oldham to discuss your options. Blepharoplasty can effectively treat problems associated with the eyelids, but you should keep in mind that this procedure is not designed to address crows’ feet or raise sagging eyebrows. Dr. Oldham offers non-surgical skin treatments to help minimize wrinkles radiating from the corners of the eyes and brow lifts to raise a low brow line. These and other cosmetic procedures can easily be performed in conjunction with your eyelid surgery. In the weeks prior to your procedure, it is important to cut down, or eliminate entirely, smoking and drinking alcohol. Avoid taking vitamin E, gingko biloba, ginseng, and NSAIDs, as well as aspirin or any medication containing aspirin or ibuprofen as these substances can contribute to prolonged bleeding. We can offer recommendations for acceptable alternatives to medications. The day before your surgery, you should make sure to have ice packs on hand, as well as clean washcloths, sterile gauze pads, acetaminophen, and artificial tears. Dr. Oldham will prescribe you stronger pain medication in the event you need it. It is also important to have enough groceries for the week. Lastly, you should schedule a friend or loved one to drive you to and from your procedure. There are several different techniques Dr. Oldham can use to enhance the appearance of your eyes. The standard technique typically involves removing or redistributing fat deposits and trimming excess skin and muscle from the upper or lower eyelids. Eyelid surgery may last approximately one to two hours, depending on the extent of the procedure, and you can expect to recover in the comfort of your own home. 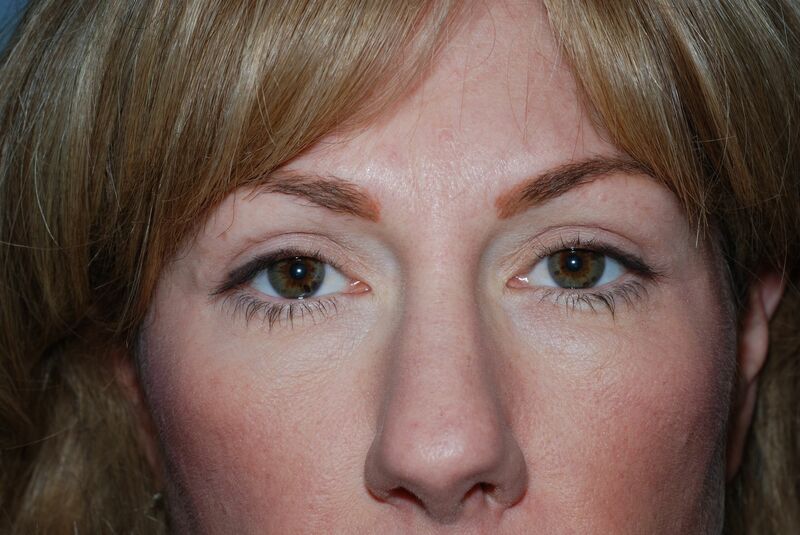 This patient addressed drooping upper and lower lids with a blepharoplasty procedure, for an overall rejuvenated appearance. On the day of your procedure, you may receive either local anesthesia or general anesthesia to keep you comfortable. Dr. Oldham can then create tiny incisions that are carefully hidden in the natural folds of your eyelids. The location of the incisions will depend on the type of eyelid surgery performed. To treat the upper eyelids, the incisions will be camouflaged in the eyelid crease. 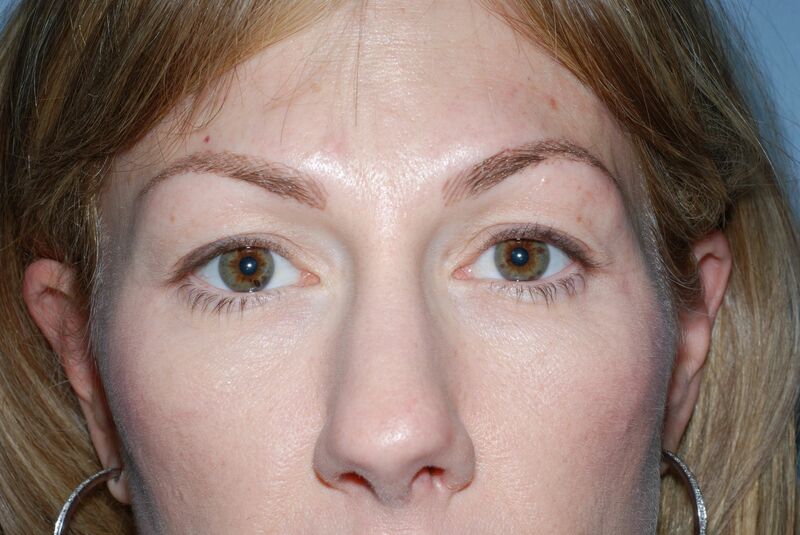 Dr. Oldham can follow the natural contours of your eyelid to make the resulting scars as inconspicuous as possible. Through this incision, Dr. Oldham can carefully remove excess skin, and in some instances, a small strip of muscle. In addition, he may access the fat deposits in your upper eyelid and remove a small portion of fat to reduce puffiness. When finished, he can close the incisions with either non-absorbable or absorbable sutures. Each blepharoplasty procedure is individualized to meet a patient's unique needs, and can be customized to address the upper eyelids, lower eyelids, or both. To address concerns with the lower eyelids, incisions are typically placed just underneath the eyelashes in a natural crease. Depending on how much of an under-eye bag you have, Dr. Oldham may choose to remove fat from under your eyes. More commonly, the fat is shifted from a bulging area to a hollow area, creating a more even and natural look. Sagging muscles can be tightened at the same time and excess skin may also be removed. It is common to experience some swelling and bruising after surgery. To reduce these side effects, you should keep your head elevated for several days and apply cold compresses to your eyes. The amount of bruising varies and can last between two and three weeks. It is important to clean the eye area regularly, especially during the first week. Dr. Oldham may also recommend eye drops if you experience dryness of the eyes or eyelids. Other common concerns directly after surgery include excessive tearing, sensitivity to light, and temporary blurring of vision. Any non-absorbable sutures placed during your procedure will be removed within one week, at which point swelling and bruising will gradually begin to subside. Healing times vary, but most patients can expect to return to work within a week or two. Patients can resume more rigorous activity roughly two weeks later. You may still experience sensitivity to light for a short time after surgery, which you can manage with sunglasses and sunblock when outdoors. During recovery, it is important to refrain from activities that raise your blood pressure. Once healing is complete, patients can enjoy the full effects of their procedure, and show off their more youthful appearance. Eyelid surgery can improve signs of aging around your eyes and boost your self-confidence. Contact our office online or call (301) 530-6100 to schedule your consultation and find out whether blepharoplasty is right for you. Our friendly team would be happy to answer any of your questions or concerns and review the factors affecting the cost of treatment.